For a young company we've managed to get in the press a couple of times. This page just links to the articles and gathers them in one place. Clyde Imagineering has devised a dossier to regenerate the town, with events and projects lasting until 2022. A community regeneration group has outlined seven projects to put Irvine back on the map. 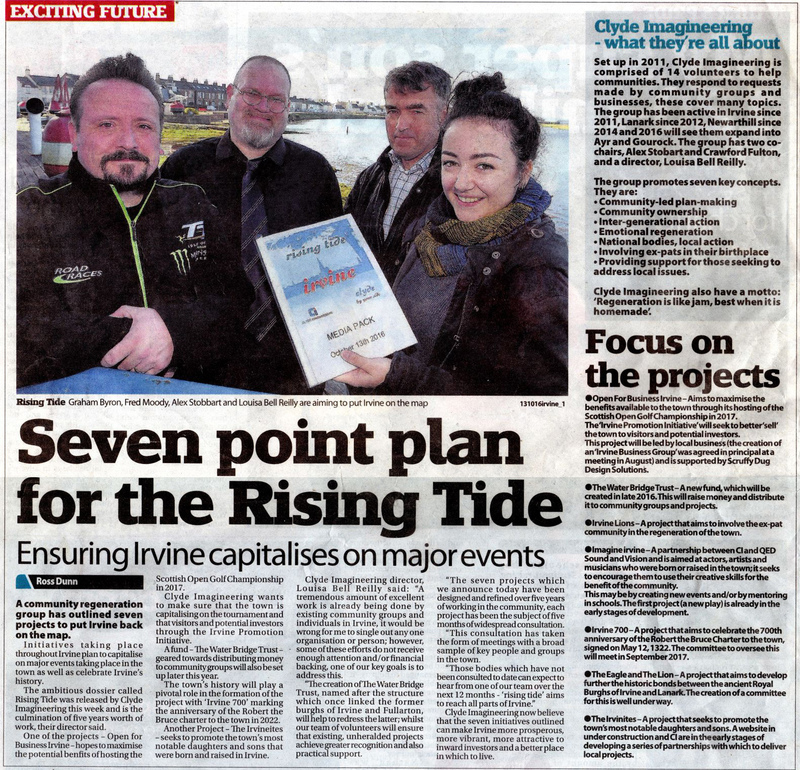 Initiatives taking place throughout Irvine plan to capitalise on major events taking place in the town as well as celebrate Irvine’s history. The ambitious dossier called Rising Tide was released by Clyde Imagineering this week and is the culmination of five years worth of work, their director said. One of the projects – Open for Business Irvine – hopes to maximise the potential benefits of hosting the Scottish Open Golf Championship in 2017. Clyde Imagineering wants to make sure that the town is capitalising on the tournament and that visitors and potential investors through the Irvine Promotion Initiative. A fund – The Water Bridge Trust – geared towards distributing money to community groups will also be set up later this year. The town’s history will play a pivotal role in the formation of the project with ‘Irvine 700’ marking the anniversary of the Robert the Bruce charter to the town in 2022. Another Project – The Irvineites – seeks to promote the town’s most notable daughters and sons that were born and raised in Irvine. Clyde Imagineering director, Louisa Bell Reilly said: “A tremendous amount of excellent work is already being done by existing community groups and individuals in Irvine, it would be wrong for me to single out any one organisation or person; however, some of these efforts do not receive enough attention and/or financial backing, one of our key goals is to address this. “The creation of The Water Bridge Trust, named after the structure which once linked the former burghs of Irvine and Fullarton, will help to redress the latter; whilst our team of volunteers will ensure that existing, unheralded projects achieve greater recognition and also practical support. “The seven projects which we announce today have been designed and refined over five years of working in the community, each project has been the subject of five months of widespread consultation. “This consultation has taken the form of meetings with a broad sample of key people and groups in the town. Clyde Imagineering now believe that the seven initiatives outlined can make Irvine more prosperous, more vibrant, more attractive to inward investors and a better place in which to live. What are the seven projects? Open For Business Irvine – Aims to maximise the benefits available to the town through its hosting of the Scottish Open Golf Championship in 2017. The ‘Irvine Promotion Initiative’ will seek to better ‘sell’ the town to visitors and potential investors. This project will be led by local business (the creation of an ‘Irvine Business Group’ was agreed in principal at a meeting in August) and is supported by Scruffy Dug Design Solutions. The Water Bridge Trust – A new fund, which will be created in late 2016. This will raise money and distribute it to community groups and projects. Irvine Lions – A project that aims to involve the ex-pat community in the regeneration of the town. Imagine irvine – A partnership between CI and QED Sound and Vision and is aimed at actors, artists and musicians who were born or raised in the town; it seeks to encourage them to use their creative skills for the benefit of the community. This may be by creating new events and/or by mentoring in schools. The first project (a new play) is already in the early stages of development. Irvine 700 – A project that aims to celebrate the 700th anniversary of the Robert the Bruce Charter to the town, signed on May 12, 1322. The committee to oversee this will meet in September 2017. The Eagle and The Lion – A project that aims to develop further the historic bonds between the ancient Royal Burghs of Irvine and Lanark. The creation of a committee for this is well under way. The Irvinites – A project that seeks to promote the town’s most notable daughters and sons. A website in under construction and CI are in the early stages of developing a series of partnerships with which to deliver local projects. Set up in 2011, Clyde Imagineering is comprised of 14 volunteers to help communities. They respond to requests made by community groups and businesses, these cover many topics. The group has been active in Irvine since 2011, Lanark since 2012, Newarthill since 2014 and 2016 will see them expand into Ayr and Gourock. The group has two co-chairs, Alex Stobart and Crawford Fulton, and a director, Louisa Bell Reilly. Clyde Imagineering also have a motto: ‘Regeneration is like jam, best when it is homemade’. The initiative being run from Irvine's Old Parish Church has seen over 1300 photos taken in the cemetery. A new macabre project has enabled people to view a graveyard’s headstones from the comfort of their own living room. The initiative based at Irvine’s Old Parish Church is hoping to combat the cemetery’s dilapidated state - and give the graveyard a new lease of life online. The project, set-up by volunteers in the town, has seen every single headstone in the main churchyard photographed – over 1300 picture pictures – and preserved online, with visitors able to explore the churchyard via an interactive map. 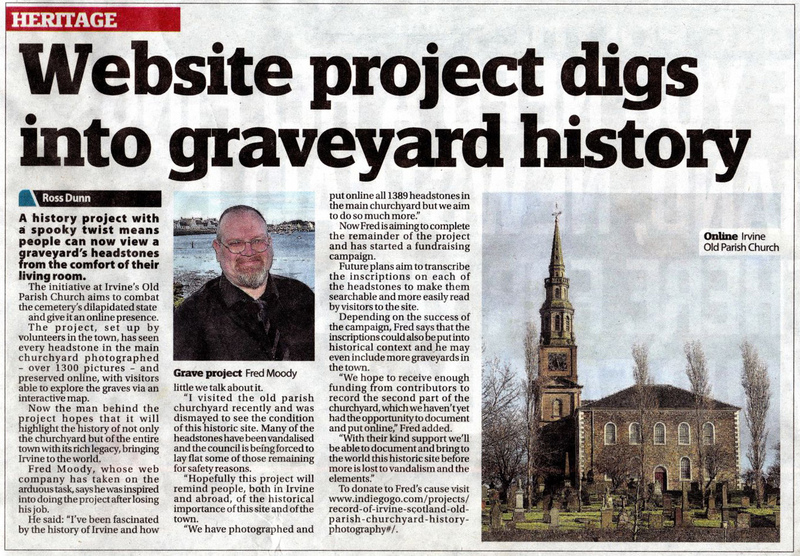 Now the man behind the project hopes that it will highlight the history of not only the churchyard but of the entire town, its rich legacy and to bring the Irvine to the world. Fred Moody, whose web company has taken on the arduous task, says he was inspired into doing the project after losing his job. He said: “I’ve been fascinated by the history of Irvine, and how little we talk about it. “I visited the Old Parish Churchyard recently and was dismayed to see the condition of this historic site, many of the headstones have been vandalised, and the council is being forced to lay flat some of those remaining for safety reasons as they pose a public safety issue. “Hopefully this project will remind people, both in Irvine and abroad of the historical importance of this site and of the town. Now Freddy is aiming to complete the remainder of the project and has started a fundraising campaign. Future plans also aim to transcribe the contents of each of the headstones to make them searchable and more easily read by visitors to the site. Depending on the success of the campaign, Freddy says that the inscriptions could also be put into historical context and may even include more graveyards in the town. “We hope to receive enough funding from contributors to record the second part of the churchyard which we haven’t yet had the opportunity to document and put online,” Freddy added.